Description: Ospreys are large birds of prey with dark brown plumage on their upperparts and white underparts with small brown spots on their breasts. They have brown tails barred with white and white underwings. Ospreys have white heads with long feathers on the nape and dark brown eye-stripes. They have hooked black bills, yellow eyes and blue-grey legs and feet. Male and female ospreys look similar, but the female is slightly larger. Juvenile ospreys have dark brown plumage and the spots on its breast are not so obvious. They have orange-red eyes. Nesting: Ospreys nest in dead trees or on man-made structures such as poles, towers and other tall buildings. Both male and female build the bulky nest from sticks which is line with softer materials including grasses, kelp, cardboard and even plastic bags. Ospreys lay 2-4 whitish eggs with reddish-brown markings which are incubated by both parents for about 40 days. The first chick to hatch is larger than the others and the smallest often doesn’t survive. Both parents feed the young until they fledge at 50-75 days after hatching. 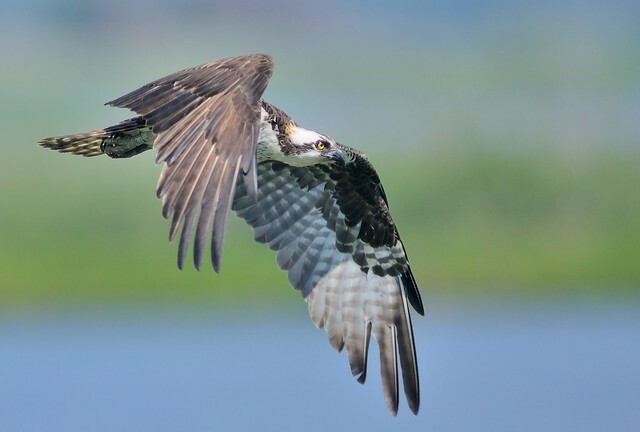 Feeding: Ospreys eat mainly fish but will also take birds, snakes and small rodents. Where to see them: Ospreys are found in Scotland and north east England near large bodies of freshwater. During passage migration they can be found in southern England. Did you know? Ospreys became extinct in the UK in the early 20th century. Scandinavian ospreys then moved to Britain and started breeding in 1954.